Community Spirit + Celebrating Life! February 2017 (Ponte Vedra Beach, Florida)… SenioRITAs raised $101,283.94 during the 17th Anniversary of SenioRITAs Tennis Tournament at Sawgrass Racquet Club in Ponte Vedra Beach in October, 2016. The SenioRITAs Mission of providing funding for research, education, equipment and patient programs continues to raise the bar of giving during the largest charity tennis event in the Jacksonville area. 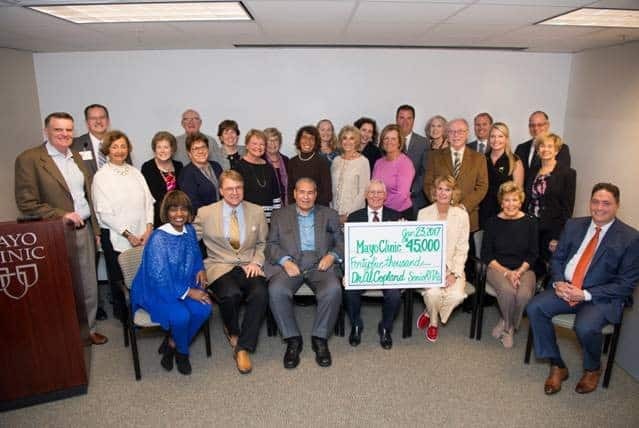 The organization proudly donates to Mayo Clinic Jacksonville and Baptist Medical Center Beaches to help fight breast cancer. $2,285 given in memory of Nancy Alderman was added to the existing $200,000 SenioRITAs at Sawgrass Cancer Endowment totaling $52,285. THIS ENTIRE AMOUNT IS BEING MATCHED BY THE BAPTIST HEALTH FOUNDATION. The Tennis Weekend (held October 21-23, 2016) at Sawgrass Country Club was chaired by Karen Aaro and Chuck Jantz. Each volunteer brought their own passion to securing sponsorships, live and silent auction donations, party decorations, players’ goodie bags, event catering, website updates, event registration for teams of 4, event planning and teamwork! 100% of the tournament and events’ profits have been presented to Mayo Clinic and Baptist Beaches for Breast Cancer with an ‘all-volunteer staff’. With over 300 women emanating from throughout the Jacksonville area, out-of-state tennis players also participated in the tournament and kick-off parties leading up to the big event.